Start Your Holidays with Great Savings! 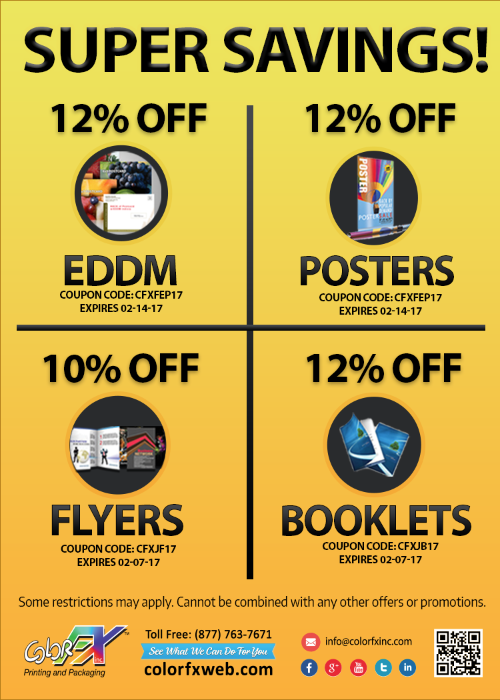 12% off on Calendars, EDDM postcards & Flyers from Colorfxweb.com. 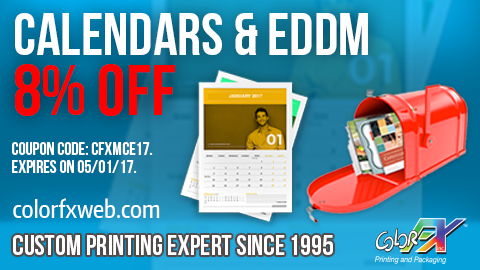 Calendars Coupon Code: CFXNOVC16. Expires 11/30/16. 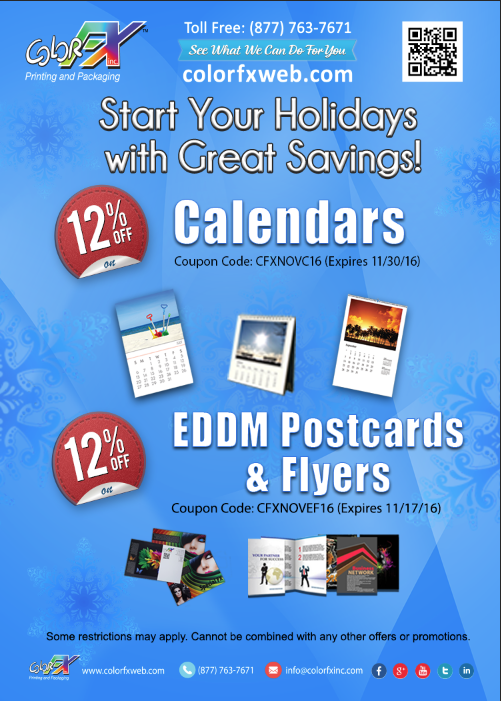 EDDM Postcards & Flyers Coupon Code: CFXNOVEF16. Expires 11/17/16. Marked by their simple effectiveness and affordability, postcards have carved their own niche in the world of marketing with a number of valuable applications. First, they allow you to hone your target demographics to a specific, usable cross-section of what is first a looming amount of data. Next, Postcard Printing establishes an instant connection with prospective clients and customers because postcards aren’t hidden or encumbered by envelopes like their direct mail counterparts. These benefits, however, will only befall the marketing entity that knows how to effectively market their products and services on a postcard. Without a definitive direction, specificity, and a powerful image, it is very difficult even for postcards to avoid the waste bin. Before diving into the tonal elements of the picture itself, you must first establish a definitive direction. This is based on the reaction that you want your postcard to have on the consumer and as such should act as a guide for the rest of the decisions involved in production of every aspect of your marketing message. Whatever your exact approach is, the general goal is that the consumer is intimately acquainted with your brand or brands, and will contact you or physically come to your store. If you work on behalf of marketing or advertising clients, but you just don’t have the time or resources to manage your clients’ direct mail needs on your own, Color FX Web can help. We offer Every Door Direct Mail (EDDM) advertising, so you can focus on running your business while we handle your clients’ local print advertising needs. 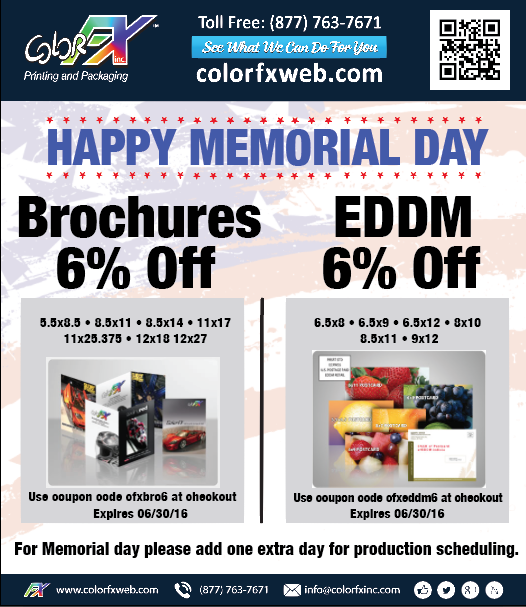 At Color FX Web, we strive to help your clients achieve their goals with our superb line of direct mail printing products, and that in turn bolsters your business. Direct mail advertising remains an invaluable marketing tool, even in this increasingly digital age, because there is no more effective way to reach out to the local population. Just as versatile as the product itself are the customizable options that we offer. Your clients can choose from four different sizes and three different coatings, so that the product reflects their explicit goals, needs, and brand. Our direct mail printing service is one of the most cost-effective ways to advertise your clients’ products or services. However, inexpensive doesn’t mean cheap at Color FX Web. We print using only the latest high-tech equipment, with soy-based inks and post-consumer recycled paper stock.